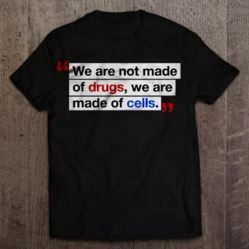 Wear this T-Shirt to the FDA hearing! Update: Over 600 event registrations arrived at the FDA, causing cancellation of the hearing. Thank you everyone, your voice is being heard! For all the details, see the 3/16/2016 BioInformant post. The FDA has announced a 1 day public hearing to obtain input on the four recently issued draft guidances relating to the regulation of stem cell therapy in the U.S. The restrictive proposed regulations will prevent countless patients from receiving this life-changing treatment. The FDA will consider information from medical professional as well as the public/patients on the finalization of these guidances on April 13, 2016. Read examples here of how stem cell therapy has been making news for saving patients from disabling, even life threatening illness. The FDA regulations would further limit or stop access to these treatments in America. WE NEED TO LET OUR COLLECTIVE PATIENT VOICE BE HEARD!!! April 13, 2016 8:00 a.m. – 5:00 p.m. Please register even if you can’t attend in person. We are requesting webinar access for those who cannot travel. Provide the following info in your email. Comments are not required, but you can include one about your concerns. Please save it for submitting to the Federal Register. Instruction on how to do this will follow. As a “No Option Patient” with a disabling chronic disease, I would like the option to be treated with my own cells, especially when all other FDA approved therapies have failed me. Please consider this when rendering your decision on the minimal manipulation of stem cells. As a patient who has received cell therapy with quality of life benefits I can attest I wouldn’t be alive today if it wasn’t for the adult stem cell therapy I have received. I should have the right to this therapy here in the U.S. without having to travel offshore. I am a caregiver of a once vibrant, active and intelligent human being. It is heartbreaking to watch the deterioration of a loved one who could potentially benefit from cell therapy. This a travesty beyond measure. The FDA is a non-elected appointed regulatory body. Citizens have little recourse to object to the control they are trying to take of the practice of medicine. Please inform your elected Representatives of what is happening. To find your Representative’s contact and email info, click here. 1)	Overview of regenerative cells and potential usefulness to medical practice, explaining the scientific data available for us of non-embryonic stem cells, their safety and ethical acceptance. 2)	Forcing US citizens to leave home as medical tourists for untested therapies. 3)	Importance of the physician’s role in the “Practice of Medicine” and the physician patient covenant. 4)	Patient’s Bill of Rights including access to all potential treatments regardless of costs. 5)	Patient’s “Right to Try” laws and the off label use of regenerative cells. a)	Allowing for patient funded clinical studies in the US. b)	Establishing general and disease specific patient registries designed to collaboratively advance the science and clinical protocols. 7)	Bioethical concerns associated with delaying/denying the aggressive testing and development of quality of life improving and life saving therapies. 8)	The de facto exclusions of these therapies for children in the US. This entry was posted in Take Action on 01/04/2016 by patients.